MASTERTRONIC has obtained budget rerelease rights to all Activision’s products, and has started issuing them at £1.99 and £2.99. Titles already out include Ghostbusters (60% Overall in CRASH Issue 13), The Eidolon (75%/36), and Balblazer (71%/28), all on the Ricochet label. Other Ricochet rereleases include Electric Dreams’s Aliens (84%/37), Ocean’s Transformers (6056/27) and Virgin Games’s Smashed Dan Dare (92%/32), and on the Mastertronic label comes Gremlin Graphics’s Trailblazer (88%/34). In a separate deal, Hewson’s £2.99 budget label Rack It is releasing old Gargoyle Games titles such as Tir Na Nog (92%/11), Sweevo’s World (95%/25) and Heavy on the Magick (9 out of 10 in Issue 29). Hewson also plans a Smashing +3 disk compilation of Tir Na Nog, the highly-regarded Dun Darach (97%/18) and (95%/22) Marsport. Oceans of experience: Special FX has signed a deal with Ocean to handle the business side of its releases, and this month’s Smash Firefly is the first under that arrangement. It follows a fling with Software Projects, which published Special FX’s Hysteria. 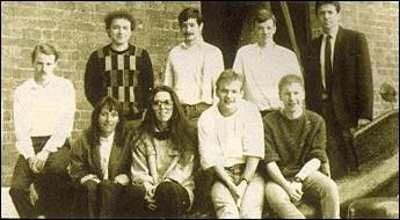 And the Liverpool-based development house’s boss Paul Finnegan (top right) and Firefly programmer Jonathan Smith (bottom right) are both ex-Ocean men. Smith’s previous Ocean/Imagine credits include Green Beret and Smashes Cobra and Hypersports, and ex-Ocean programmer Tony Pomfrit (Rambo, Daley Thompson’s Decathlon) is also working with the new team — whose future projects for Ocean include the Robocop film licence. THE PCW Show has abandoned London’s Olympia exhibition hall — and opted for a name-change too. Now known as The Personal Computer Show, Britain’s top exhibition for software and hardware will be based at Earls Court, London’s biggest exhibition centre. Earls Court is bigger than Olympia — 23000 square metres rather than 18000 square metres. And the extra room’s essential. Organisers of the 11th annual show this September hope to see more than 90,000 visitors, some 10,000 up on 1987. The new-look show will have a completely separate hall for games and home computing, whereas at Olympia The PCW Show had some business-type stands (such as Amstrad) in the leisure area. Despite the name-change, Personal Computer World magazine continues to ‘present’ the show. This year’s Personal Computer Show will be held at Earls Court from September 14–18. The Home Entertainment Dealer Show starts this year at Birmingham National Exhibition Centre and will be held August 16–18, not the May days originally announced. DS, mainly for the video industry, will probably include a viewing theatre for the public. TWO software houses are withdrawing from the British market. Nexus went into liquidation in January with debts believed to be as high as £200,000, just months after signing an ‘affiliated label’ distribution deal with Electronic Arts. And West German-owned Ariolasoft will close its UK operation at the end of March, probably selling its software titles to a British house before then. The move followed Ariolasoft’s disappointing sales last autumn. FIREBIRD flew through a legal battle when a court gave it the go-ahead to publish Morpheus and Magnetron — but a new argument is developing between sister label Rainbird and adventure programmers Level 9. In the court case, Hewson had claimed it should release the two titles programmed by the Graftgold team — and took Firebird to court after the Telecomsoft label signed a contract with Graftgold. Hewson believed its earlier arrangement with Graftgold gave it rights to the two disputed games. But the case ended with Firebird getting Morpheus and Magnetron — which will be the first products of Graftgold’s tong-term exclusive contract with Firebird. The Level 9 dispute follows a sudden severing of Rainbird’s relationship with the programmers of Knight Orc (interviewed in the last CRASH). They’d signed a four-game contract with Rainbird in April 1986, but Telecomsoft says Level 9 was always late with finished games — and after the breakup the programmers moved to a new label, Mandarin, which will release their next game Time & Magik. CODE MASTERS plans to help the world famine-aid charity Sport Aid — by writing a special game based on the sports extravaganza and donating all proceeds to it. The game will probably be based on Sport Aid’s sponsored ‘race against time’ run. Before the mass race an athlete runs through several cities carrying a torch, and the game will likely follow that star runner. An April release is expected. THE most-played arcade game of 1987 will be Melbourne House’s first release under a massive new coin-op licensing deal, according to the Mastertronic full-price label. Melbourne House will release Double Dragon to celebrate its exclusive worldwide home-computer rights to all Technos arcade games. Future Techno products are covered by the arrangement, as well as current arcade successes — Melbourne House says it’s the first time a major Japanese coin-op company has assigned computer rights to future coin-ops. The agreement follows a £2 million rights deal by GO!, US Gold’s sister label, which will release about ten conversions of Capcom coin-ops in the next year. The first will be a follow-up to 1942 (the computer game was from Elite) — called 1943.